1. The first Monday of December has arrived. There are only three Mondays left this year. 2. There are 21 shopping days until Christmas. 3. I think we finally have all of the seasonal decorations out of their storage boxes and on display to brighten the otherwise dark season. 4. 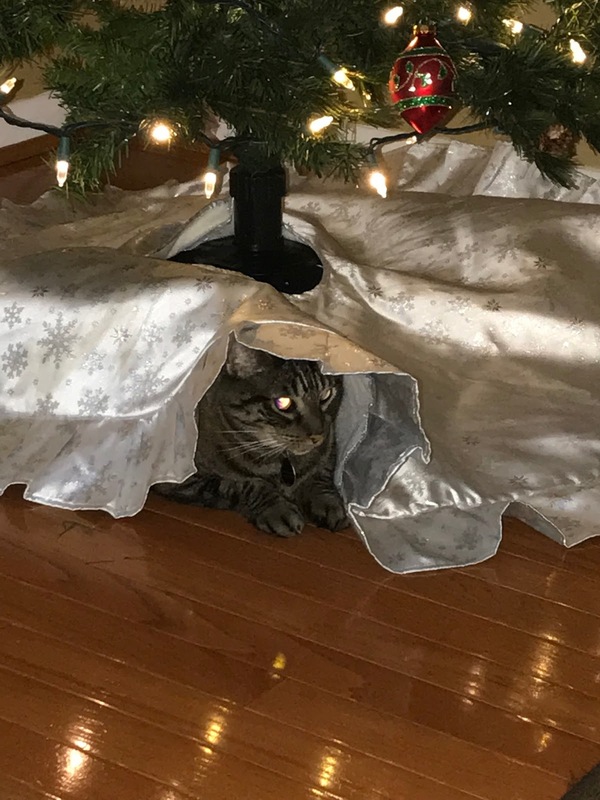 Riordin, the cat, uses the tree skirt as a means to hide from and then attack Finnegan, our Yorkie. They play very well together. 5. Beautiful December weather has been evident the past few days, however, the impending weather report is full of cold and even ac mention of snow. And so it begins . . .
6. We have been doing a lot of shopping on line again this year. We have been driven to it because the "brick and mortar" stores seem to be out of everything we are looking for. 7. We did get ourselves and early Christmas present. We are not the proud owners of a GE Sol. We are still unlocking its features, but we like it. 8. I am way behind in my racquetball league--I think I have to play three games this week to get back on schedule. "Let's not go back. Our choice must be to keep our nation strong, free, and full of hope. America is a great and generous nation. We are the beacon of liberty and freedom to all the world. Together you and I, with the help of the Republican team, can finish the job. We can realize the dreams our critics said were not possible."